HOLLYWOOD—Timothy Spall remembers a time when he couldn’t walk the streets of Belfast without being very cautious. He was in the Northern Ireland capital attending a film festival some 30 years ago. To get to his hotel, he couldn’t walk through the front door. He and other guests had to take a side entrance where they underwent a stringent security check. How things have changed. Earlier this year, the British actor returned to Belfast to attend the premiere of “The Journey,” in which he portrays Democratic Union Party leader and loyalist Rev. Ian Paisley, who in 2006, reached a peace agreement with Sinn Fein leader and former Irish Republican Army chief of staff Martin McGuinness, in a landmark power-sharing resolution to “The Troubles” that afflicted that region of the world for so many years. The 60-year-old actor recalled feeling safe walking alone after dark on the streets and had no trouble accessing the front entrance of his hotel. The actor spoke by phone about portraying the fiery politician, who became the First Minister of Northern Ireland, and ended up becoming friends and colleagues with McGuinness (who was Deputy First Minister), after years of being unable to even acknowledge his presence. Although Paisley, who died in 2014, was not a well-known political figure outside of the U.K. and Northern Ireland, his distinctive appearance and legacy is quite familiar to those who grew up in that era of bloody conflict. Spall co-stars with Colm Meaney, who plays McGuinness, as they travel from their neutral meeting location in Scotland to an airport in a carefully orchestrated long limo ride across the countryside where they hash out their differences and grievances with one another before coming to an agreement. Spall: I grew up in London and it seemed like the conflict over Northern Ireland seemed to go on forever and ever. It was a conflict that seemed unresolvable in our own homeland. It seemed very bizarre, destructive and horrendous. The figures that turned up in it, particularly Dr. Paisley, who was perceived as pouring petrol on into the flames of this division. Of course, each side would have a different view of it. Each side was accused of doing that. The republican side and the religious association that drove them seemed to be getting further and further towards a terrible (end). There seemed to be no resolution. Eventually, all of the moderate voices dispersed because people were rallying around the extremes, and it seemed like an impossible impasse was reached. The remarkable thing was these two arch-enemies, through their common connection between their common humanities, given their loathing for each other’s principles—they wouldn’t even acknowledge each other—they reached a cross and stopped this terrible violence. In an international sense, it really comes under the heading if these two guys can do it, resolving a seemingly irresolvable conflict, it can be done anywhere. Q: As an actor, what challenges and opportunities did “They Journey” present to you? Spall: I would be fibbing if I were to say that I wasn’t terrified as well as intrigued by the challenge of playing somebody who was so well known. Plus, it was such an emotive and dangerous subject. As someone who’s interested in global matters, humanity, I was very intrigued to try to wrap my head around a person whom I had preconceived ideas about. In the process of when I was asked to do it, and when I agreed to do it, I read extensively about (Paisley) and where he came from, the roots of this and the history of the Northern Ireland situation. Through the process of being selfishly being an actor and wanting a challenge and being frightened of the prospect of playing somebody, I educated myself about the situation and it was something I’d kind of been hoping to get my head around. So, this double thing about the challenge and changing my opinion about the situation was a great moment for me, really. It was an educative thing. It seems like its perceived as a massive beacon of hope for conflict all over the place, everywhere really. Spall: We were in that film but we didn’t have any scenes together. I really rate Colm as an actor. I’ve been watching his work elsewhere. When they told me he was playing McGuinness, I knew absolutely he was the right man for the part. Contrary to popular opinion, actors don’t want to work with actors who aren’t very good to make them look better. Instead, the better the actor you work with, the better you look. It’s hard enough when you’re playing someone and trying to create that human being but when you’re in that state and looking across at somebody being really good like Colm Meaney is in that role, it raises your game, and you’re playing these characters as though they’re actual humans saying these lines for the first time. Q: Since you both were around during “The Troubles,” between takes did you talk politics? Or did you relax and talk about your families? Spall: It was a mixture of both. We rehearsed a little bit and talked a lot about it. We both grew up with it. Although Colm, who was born in Ireland, moved away to America as an adult. I grew up in London. It was always going on. There was a very active bombing campaign on the homeland in London. So we were all directly involved in it. The thing is, we knew we had a job to do. We both got on as we did with the director and the crew. It was a lovely crew. You get this serious work and you chat about this, that and the other and get through. I knew I wanted to play (Paisley) very much from the inside. I kept the character on a low heat, a little bit. So, I was quiet at times, and at times I liked to have a chat. Sometimes I’d disappear and like to be quiet for a while. The job had to be done. We had to concentrate but we were both very prepared. There are a lot of words in it, a lot of talk that seemed like it’s conversational, so you have to go off and bone up on them and do all that stuff that makes it look like you are just saying this. So, it’s a mixture of the two. Q: Because you’re playing a man much older than yourself, you had to wear a lot of makeup and false teeth. What was that process like? 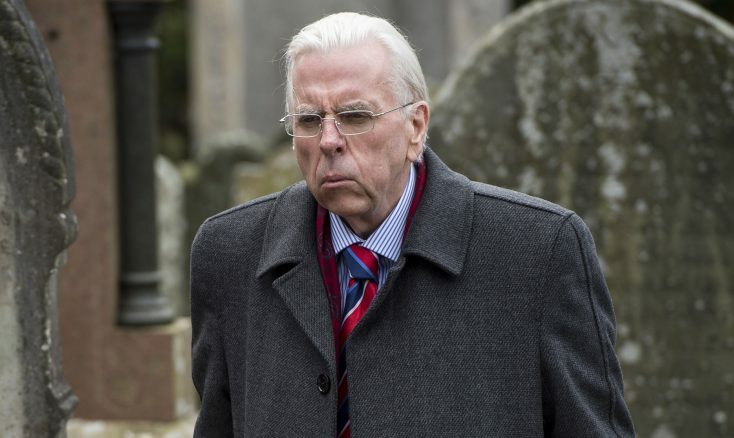 Spall: All I had was a small prosthetic chin and false teeth. I bleached my hair white so I wouldn’t have to wear a wig. It had more to do with playing somebody who was 80 and ill and somebody who felt the weight of time and everything upon him. It’s about understanding that and playing it from the inside and portraying it and feeling it rather than having to use too many exterior things like wearing big shoes to feel a bit taller. The guys got the makeup process to about 40 minutes in the end. Q: “The Journey” premiered at the Belfast Film Festival. Were you concerned about how this dramatization of a still rather recent event would be received? Spall: The response was fantastic. There were a few public screenings as well as the premiere. That was an incredibly moving experience because the response from the audience during a Q&A was fantastic. People were very emotional. You could see that they could see it was about them and it was about hope. They have done things about that awful experience that these two enemies found common ground to stop. I had been worried about possible negative feelings about being there and doing this, but both Sinn Fein and the DUP were at the screening. They were both familiar with the play. The director had talked to them previously. They hadn’t interfered with it. Thirty years ago, I went to Northern Ireland to attend a film festival. When you went to a hotel, they were surrounded by fences and barbed wire. You weren’t allowed to go out the front door. You had to go through a separate shed and go through a security process. It was like being in the midst of West Beirut. There were soldiers everywhere and conning towers. It was an odd dystopia, people trying to get on with their lives. It was a very odd place. You had to keep your wits about you. When I went to (“The Journey”) premiere, both the Sinn Fein and the DUP were in the cinema and afterwards I went to a late-night chat show where there were many politicians on that show. We were staying in the Europa Hotel, which is a very nice hotel but notorious for being one of the most bombed hotels in Europe. After the talk show was over, I walked back through the streets of Belfast to my hotel, having played the reverend Ian Paisley in a movie, on my own, to the hotel without one problem. So, things have changed. Spall: That was the ultimate sacrifice. It’s what they had to do because they were in this position as the two last men standing with the full support of their people because they said they’d never compromise. There’s the fait accompli, in essence. There’s the difficulty. But’s that what they had to do. They had to risk betraying their own people by their compromise. This is the conundrum of many conflicts. But these two remarkable, powerful men did that. Ultimately, people stopped killing each other over there because of it. That, on a human level, is just an amazing achievement. There had been a lot of bloodshed, a lot of sorrow, a lot of pain that was laid to rest, so it’s a remarkable thing—the power of forgiveness. Q: The film dramatizes what happened. How do you respond to people who complain that this film doesn’t show the accord exactly as it happened? 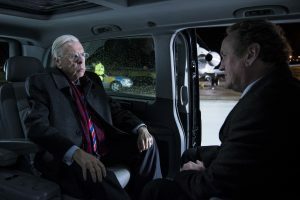 Spall: It’s not purporting to be anything other than a take on what happened—a meeting that took place on an airplane rather than a car, but it is a vehicle like many films. “Lincoln,” “Frost/Nixon,” “The Queen,” “The Iron Lady”—they’re all a version of, a bit like Shakespeare, the histories are not exactly what happened. Because it’s recent history, some people find it difficult to take. But what it is is it’s taken a nugget, an essence, of what a drama can do more than a documentary, and use the power of imagination to take this as a vehicle and follow the line of these guys to grind out those axes to be ground against each other without any impediment without having to appeal to their own bases, that’s beyond television or to spin. It’s an opportunity to put these two men together and what happened, of course, this was an investigation of how they found a common humanity between them. How these arch-enemies became very good friends. They were political opponents but they managed to maintain this very close friendship. They became known as “The Chuckle Brothers.” It’s an amazing thing how they turned the energy of conflict into the energy of compromise. Q: Did you get a chance to meet Martin McGuinness, who died earlier this year? Spall: No. In the end, I believe he did approve of (the film), knowing it was a fictionalization. I did have an opportunity to meet Baroness Eileen Paisley, who was very important to me when I was playing Dr. Paisley. I never did anything to offend the family. Ian Paisley Jr., who’s a (Member of Parliament), was very pleased with it. I was pleased to see him say in public that I had caught some of his father’s mannerisms, bang on to the point where it stopped him in his tracks. So, I was very pleased I hadn’t offended anyone. I’m pleased that they, the family, knew it was a take, a vehicle, to get this event laid out before people.